Ospreys nesting in the town of Fairfield. Photo courtesy of Anastasia Zinkerman. 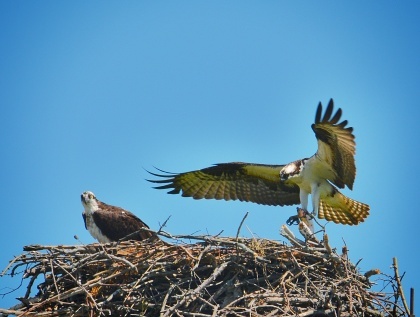 In 2014 Connecticut Audubon Society launched Osprey Nation[i], a statewide program aimed to monitor and help enhance the osprey population in the state. In a two pronged approach, the Connecticut Audubon Society has sought to support and facilitate scientific research on the ospreys, particularly the large colony at the mouth of the Connecticut River, and to build a broad citizen science program to monitor their health across the state. Conceived in partnership with Connecticut’s Department of Energy and Environmental Protection, the stewardship program is designed to collect and record information, in a database and interactive map, about every Osprey nest in the state. In the program’s first year, over 100 volunteer stewards located 414 nests and submitted data for 174 of these. Ospreys are a particularly charismatic bird – a large, dramatically-patterned predator that nests in highly-visible locations and, given its reliance on fish as a primary source of food, is a key barometer of the health of our environment. Connecticut has long served as an important breeding ground for Ospreys. Near the mouth of the Connecticut River alone, there were more than 200 pairs in the late 1930s[ii]. Dr. Paul Spitzer, Trappe, Md. Dr. Rob Bierregaard, Res. Assoc. However shortly after the introduction of DDT, a toxic organochlorine pesticide, in 1948, Ospreys and other avian predators began experiencing serious population declines. DDT interfered with calcium deposition and as a result Osprey eggs were roughly 20 percent thinner, which led to massive losses during incubation, as eggs simply broke [iii]; DDT probably directly affected embryos as well. DDT was banned in the United States in 1972, when Ospreys were at an all-time low. Only eight known nesting pairs were recorded in Connecticut in 1970. However the DDT ban and a citizen science volunteer effort led by the Connecticut Department of Environmental Protection, Roger Tory Peterson, Dr. Paul Spitzer, and others to build Osprey platforms and watch over nests resulted in a slow rebound. There were 10 nests in 1975, 19 in 1980, 55 in 1990, 158 in 2000, and 235 reported in 2010[iv]. Although Ospreys’ exposure to older toxins such as DDT and PCBs has been greatly reduced, they are still vulnerable to newer substances. Ospreys are the ideal sentinel species. By monitoring population levels and reproductive success, scientists will be able to spot the first signs of trouble. Programs like Osprey Nation will provide a heads-up so action can be taken before the population drops as drastically as it did with the use of DDT. Because DDT still may be used in Latin American countries, Ospreys may be at risk of some exposure. Since the Osprey diet is predominantly fish, their reproductive success and productivity is dependent on an abundant food source that is free of toxins. The health and abundance of Ospreys therefore provides insight into the health of our state’s streams, rivers and estuaries, and can give warning of toxic dangers. The Connecticut Department of Energy and Environmental Protection tracked and monitored the state’s nesting Ospreys until 2010, when its lead biologist retired. Since then, there has been no coordinated effort to locate, monitor and collect data about all Osprey nests statewide. In response the Connecticut Audubon Society, in partnership with Connecticut DEEP, created Osprey Nation. Figure 2. Stewards submitted information on data sheets. Click on the image to enlarge it. Upon the program’s launch in June 2014, observers began signing up to find and monitor Osprey nests. They included long-time birders, those new to bird watching, residents who had built Osprey platforms on their own property, and others who knew little about Ospreys but simply wanted to help. Volunteers were asked to find and identify nest sites, report on the condition of nests or nesting platforms, and if possible report on the status of the adult and young Ospreys over the course of the breeding season. The information was recorded in a spreadsheet and provided directly to DEEP. A map was created for public view on Connecticut Audubon Society’s website using Google Maps, with each nest noted by a pin (figure 1). Stewards’ photos and much of their data was uploaded to the respective locations on the map. Some historical nest sites were known before the start of the project, but most were newly provided by stewards. Many stewards were able to give nest coordinates, while others simply described where a nest was located. Those nests were then often readily found on Google Maps. Nests were classified by the type of structure they were built on as well as the condition of the nest itself. Volunteers were assigned one or more nests of their choosing. The Osprey map noted which nests had observers (green pins) and which ones did not (red pins). Data sheets were created to help guide stewards during their observations (Figure 2). Stewards were instructed to view their respective nests for about 10 minutes twice a month. Most stewards observed their nests at least this often, with many viewing their nests almost every day. A few stewards made less frequent observations, but the information was still valuable. As summer came to a close, stewards had identified 414 nest sites in five counties and 42 towns, a 176% increase over the nests reported in 2010[v]. Moreover, we are confident that there are many more nests in Connecticut still to be found. Of the 414 nests, 210 were seen as being occupied by an Osprey at one point during the season, classifying them as “active.” An additional 29 nests were confirmed by a steward as being “vacant.” Of the 210 “active” nests, 174 were continuously monitored throughout the summer. From the original 414, there are 175 nest locations that could not confirmed as either “active” or “vacant.” Other than there being a nest or platform, no other information was gathered about the use of the remaining sites. Nests were found built on at least nine different types of structures (Table 1). Though a large number of nests were found inland, the highest concentrations were along the Connecticut shoreline. The data suggest that nests closer to the shoreline are generally in good shape, and experience higher reproductive success than those further inland. Osprey Nation though is about more than just data. Its goals include raising awareness, involving people, and inspiring the next generation of conservationists. One of our newsmakers was a nest built on a utility pole near the Fresh Market in Westport. 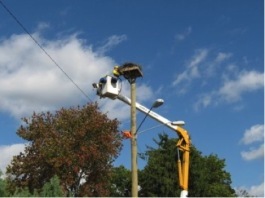 The proximity of the nest to the power lines was a fire risk, and so with our guidance Connecticut Light and Power removed the nest after the breeding season and erected a new platform for the Ospreys nearby, adjacent to an old dead tree where the adults have been observed perching (Figure 3). a nest that was a fire risk. A second example is that we were able to confirm that with 27 active nests, Great Island off Old Lyme still holds the largest concentration of nests in Connecticut, as it has since the 1930s[vi]. Several Ospreys even attempted, without success, to nest on the ground on Great Island, greatly increasing their exposure to predators and indicating a high demand for nesting. The fact that even after all the prime locations were taken Ospreys still attempted to nest on Great Island suggests the value of a nest site near the mouth of the Connecticut River with its abundance of menhaden and other fish. As part of our community outreach, in November 2014, we worked with the Old Saybrook-based Maritime Education Network and three local teenagers to replace a nest on Great Island that had fallen into disrepair. Osprey Nation clearly raised public awareness and engagement, and we now have 171 volunteers serving as stewards and expect to increase that number in 2015. Osprey Nation was covered extensively in statewide newspapers, and on radio and TV news, bringing the message of conservation and stewardship to an even greater number. With the help Dr. Paul Spitzer, Dr. Rob Bieregaard placed telemetry gear on three ospreys this summer that were nesting near Old Lyme. From Rob’s tracked birds (see both maps) we learned that while menhaden (a type of shad) in Long Island Sound were their main prey, early in the season the osprey also flew inland seeking stocked trout, alewife and other shad upriver near dams, and even found koi (large goldfish) in outdoor decorative ponds. 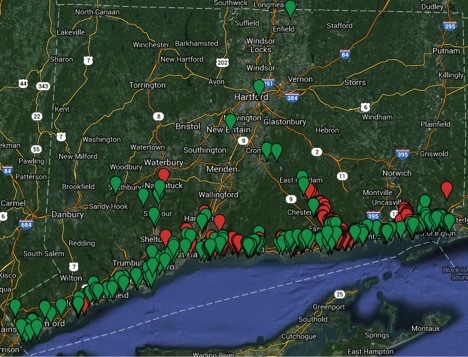 The first map shows the feeding range of one osprey named Roger Tory, who early in the season hunted trout up on the Salmon River well north of his nest site in Old Lyme. Most ospreys though, like Uncas (second map), spent their time foraging along the coastline. Paul: “I offer these ideas based on my three months of Connecticut field work in 2014, and broader involvement with ospreys and menhaden biology that extends back over a lifetime, to my initial CT work in 1968. Working again in Old Lyme, my hometown and the base for my formative years, is very much a “Roots” community experience for me. This regional field biology is the first I ever learned, and I have kept track of it lifelong, so this is a chance to give back to the community and culture that nurtured me. This means more than I could possibly say. We stand at a historic moment. In response to Federal harvest caps imposed in 2013, the population recovery of migratory menhaden has begun. CT waters of Long Island Sound (LIS) and the Ct. River Estuary (CRE) are sanctuary waters for these fish. Thus we are protecting seedstock that has the potential to repopulate the menhaden’s former northern range, from New Jersey to Maine. These beneficial fish provide an array of ecosystem services—which must be taught, taught, taught. The osprey is the prime biomonitor of menhaden abundance. For East Coast ecology and the Osprey, menhaden restoration is the most important paradigm shift since the banning of DDT in 1972. Down at the Great Island nest colony and environs, the ospreys KNOW they are in sanctuary, and we must keep faith with them. This goes back to the years of CT State (monitored by Julie Victoria, DEEP) instituting kayak/canoe trails immediately adjacent to the colony—which the ospreys now accept. This is the benign future we need in our densely populated but sensitive and cultured home state. At the nest pole closest to the TNC Griswold Point preserve, the female let me mirror contents without leaving her nest (see picture). She scolded me but moved over, on a couple visits. This was a first, in all my years of osprey study, and I was thrilled. After that I just used my Questar telescope for the nest check with larger young, out of respect for her. I hope that trust is the ecological/behavioural future of ospreys in CT—I am totally committed to it. Also, benign avoidance gives us the best ultimate reading of the annual food regime. The egg data on ospreys is in; no need to disturb them during incubation. So for monitoring I advocate just two quick checks at each nest, mostly with a convex mirror. One post-hatch, one pre-fledge, to get the brood reduction data, then mean brood size and young/active nest. The DDT story provides a model for our current education and science efforts. There were many voices, and a broad scientific effort. Information was shared, there was generosity of spirit. I came of age working on this, and I have tried to maintain a similar ethos throughout my life as a scientist and naturalist. Collegiality should be the Bread of Life for all of us. Many of us must speak and write for the importance of menhaden restoration. Osprey Cams are probably the single best educational tool we have. These cams have caught on—there are several now in the region [Note: Ct. Audubon’s cam is on this website and monitors the nest at its Coastal Center in Milford]. People can be working on their computer, and periodically divert to “The Home Life of the Osprey”, as Abbott called it, writing in 1911. The key goal of the Osprey Nation project is to find and monitor all Osprey nests in the state, and to ensure their future is a safe and healthy one. The program will resume in March 2015 as Ospreys return to Connecticut for the breeding season. We will be updating the datasheets and the map from 2014. We will also seek more volunteers and work with them to find more nest sites. In addition to the coastline nests, many inland locations have been found and we believe there are more to be discovered. 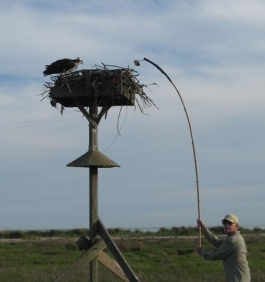 We also hope to involve some stewards in ongoing research to learn more about the feeding behavior and nesting patterns of Ospreys in the state. The colony on Great Island, thought to be the largest in Connecticut, is of particular interest. Connecticut Audubon Society is working with the local community to repair and add new platforms. The repairs not only maintain and straighten the platforms, making them safer, but they also add baffles, preventing predators (like raccoons) from the climbing the pole. Additionally, adding more platforms will provide additional nesting opportunities, limiting the number of exposed ground nests. The information we recorded 2014 is just a start. As we learn more about the nesting population, status and reproductive requirements, we will have a better understanding of the health of Connecticut’s Ospreys. Not only are they wonderful animals to study and observe, but Ospreys also provide an important indication of water quality and the health of our environment. [ii] Spitzer, Paul and Alan Poole. 1980. Coastal Ospreys between New York City and Boston: a decade of reproductive recovery 1969 – 1979. American Birds: 234-241. [iv] Bierregaard, R.O., A.B. David, L. Gibson, R.S. Kennedy, A.F. Poole, M.S. Scheibel, and J. Victoria. 2014. Post-DDT Recovery of Osprey Populations in Southern New England and Long Island, N.Y. 1970 – 2013. Journal Raptor Research 48(4):361-374. [vi] Spitzer and Poole. 1980.